The Roman province of Macedonia (Latin: Provincia Macedoniae, Greek: Ἐπαρχία Μακεδονίας)  was officially established in 146 BC, after the Roman general Quintus Caecilius Metellus defeated Andriscus of Macedon, the last self-styled King of the ancient kingdom of Macedonia in 148 BC, and after the four client republics (the "tetrarchy") established by Rome in the region were dissolved. The province incorporated ancient Macedonia, with the addition of Epirus, Thessaly, and parts of Illyria, Paeonia and Thrace. This created a much larger administrative area, to which the name of 'Macedonia' was still applied. The Dardanians, to the north of the Paeonians, were not included, because they had supported the Romans in their conquest of Macedonia. After the reforms of Diocletian in the late 3rd century, Epirus Vetus was split off, and sometime in the 4th century, the province of Macedonia itself was divided into Macedonia Prima in the south and Macedonia Secunda or Salutaris in the north. These provinces were all subordinate to the Diocese of Macedonia, one of three dioceses comprising the praetorian prefecture of Illyricum. When the Prefecture was divided between the Western and Eastern Empires in 379, the Macedonian provinces were included in Eastern Illyricum. With the permanent division of the Empire in 395, Macedonia passed to the East, which would evolve into the Byzantine Empire. Achaea or Achaia was initially part of the Roman Province of Macedonia (from 146 to 27 BC). It later became a separate Province by the Augustan Settlement of 27 BC, which established the Roman Empire. The Roman provinces of Epirus Vetus and Epirus nova in relation to modern borders. Epirus, later Epirus Vetus ("Old Epirus"; Ancient Greek: Παλαιᾶ Ἤπειρος), was a province in the Roman Empire that corresponded to the region of Epirus. Between 146 BC and 27 BC, it was part of the province of Macedonia, after which it became part of Achaea, before becoming a separate province under Emperor Trajan. Epirus Nova ("New Epirus", Ancient Greek: Νέα Ἤπειρος) or Illyria Graeca or Illyris proper was a province of the Roman Empire established by Diocletian during his restructuring of provincial boundaries. Until then, the province belonged to the province of Macedonia. Dyrrachium (or Epidamnus) was established as the capital of Epirus Nova. The region of Epirus Nova corresponded to a portion of Illyria that was then "partly Hellenic and partly Hellenized". Macedonia Prima ("First Macedonia") was a province encompassing most of the kingdom of Macedonia, coinciding with most of the modern Greek region of Macedonia, and had Thessalonica as its capital. Macedonia Salutaris ("Wholesome Macedonia"), also known as Macedonia Secunda ("Second Macedonia") was a province encompassing partially Dardania and the whole of Paeonia, the second being most of the present-day Republic of North Macedonia. The town of Stobi located to the junction of the Erigon and Axios rivers, which was the former capital of Paeonia, arose later in the capital city of Macedonia Salutaris. This province was encompassing the area of ancient Thessaly, which was right in the south of ancient Macedonia. Also herein are being mentioned the subdivisions of Thessalia Prima and Thessalia Secunda. A tetradrachm of Thasos from Roman controlled Macedonia. It was minted between 148 and 80 BC. Obverse shows Dionysos and reverse shows Herakles. The reign of Augustus began a long period of peace, prosperity and wealth for Macedonia, although its importance in the economic standing of the Roman world diminished when compared to its neighbor, Asia Minor. The economy was greatly stimulated by the construction of the Via Egnatia, the installation of Roman merchants in the cities, and the founding of Roman colonies. 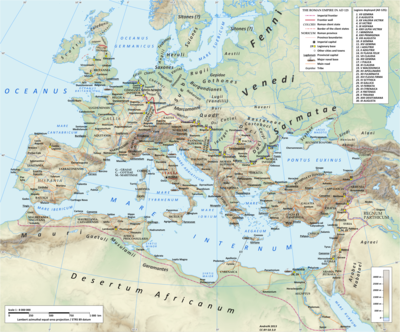 The Imperial government brought, along with its roads and administrative system, an economic boom, which benefited both the Roman ruling class and the lower classes. With vast arable and rich pastures, the great ruling families amassed huge fortunes in the society based on slave labor. The improvement of the living conditions of the productive classes brought about an increase in the number artisans and craftspeople to the region. Stonemasons, miners, blacksmiths, etc. were employed in every kind of commercial activity and craft. Greek people were also widely employed as tutors, educators and doctors throughout the Roman world. The export economy was based essentially on agriculture and livestock, while iron, copper, and gold along with such products as timber, resin, pitch, hemp, flax and fish were also exported. Another source of wealth was the kingdom's ports, such as Dion, Pella, Thessalonica, Cassandreia. ^  D. C. Samsaris, Historical Geography of the Roman province of Macedonia (The Department of Western Macedonia today) (in Greek), Thessaloniki 1989 (Society for Macedonian Studies).ISBN 960-7265-01-7. ^  D. C. Samsaris, Historical Geography of Eastern Macedonia during the Antiquity (in Greek), Thessaloniki 1976 (Society for Macedonian Studies).ISBN 960-7265-16-5. ^ Handbook of Ancient Geography and History by Ptz Wilhelm, ISBN 1-113-19974-1, The (734) southern portion, or Illyria Graeca, belonged to the province of Macedonia. ^ Atlas of Classical History by R. Talbert, 1989, page 175: "... divided the diocese of Moesia into two, styled Thracia and Macedonia, the latter consisting of the provinces from Epirus Nova and Macedonia southward. But there is evidence that Constantine considered ..."
^ Hendry, p. 299. The geography is entirely correct for Servius' time, since Diocletian's rearrangement of provincial boundaries included the creation of the province of Epirus Nova out of southern Illyricum with Dyrrachium (=Epidamnus) as its capital. † Italy was never constituted as a province, instead retaining a special juridical status until Diocletian's reforms. As found in the Notitia Dignitatum. Provincial administration reformed and dioceses established by Diocletian, c. 293. Permanent praetorian prefectures established after the death of Constantine I. Empire permanently partitioned after 395. Exarchates of Ravenna and Africa established after 584. After massive territorial losses in the 7th century, the remaining provinces were superseded by the theme system in c. 640–660, although in Asia Minor and parts of Greece they survived under the themes until the early 9th century. This page was last edited on 10 March 2019, at 15:44 (UTC).